We have already discussed about StunRay Technology and its capability to substitute tasers and guns used in law enforcement. But, there are some limitations to the amount of damage you can do to the suspect if he is not in front of you. That is why tasers are considered more effective as it will leave the suspect electrocuted and numb for a quite a long time, which is more than enough to seize and cuff him up. But, the tasers used now have a problem of “capability gap”. That is, if the suspect is standing at a distance of 40 feet away from you with a knife, you do have the advantage of using the taser effectively. But if he moves further away with a deadly object in his hand and is ready to use it against you, which will be a problem. The reason is that, most of the tasers work accurately at a range no more than 50 feet. Thus you will be forced to use a gun against the suspect, making the situation more deadly. So, the officers claim that they need a less lethal weapon than a gun and a better weapon than the conventional taser. This is where XREP, comes into action. XREP stands for Extended Range Electronic Projectile. It is a twelve gauge wireless projectile that has a firing range of 100 feet and can be capacitated from any kind of pump-action shotgun. As soon as the slug is fired from the gun, it speeds through the air and penetrates the suspectâ€™s skin and causes sudden muscle paralysis. Thus, it is better than a Taser and has the common mechanism of a shotgun. The manufacturers faced a huge challenge when it came to the design of such a device. One problem they faced was in reducing the overall size of the device. As there is a difference in the amount of voltage that is applied by the device on a human body, the circuit size could easily be reduced accordingly. A conventional taser produces almost 50,000 volts of electricity while a XREP uses no more than 500 volts. While a normal taser arcs the current to the body, this device uses barbed electrodes to pierce the skin. According to the engineer behind the device, Mark Hanchett, the voltage may be very less for a person to be stunned, but it is the waveform produced through it that actually matters. The current produced by the device will cause temporary damage to the nervous system. The developers are trying to upgrade the device by releasing a grenade version that is able to launch up to 200 feet. The diagram of a shock bullet taser XREP is shown below. The electrifying bullet can be released from any pump action shot-gun. A picture showing the inside of a XREP bullet shell is given below. Nose – They are basically 4 electrified barbs that are used to pierce the skin. The shock delivered from the nose will first be sensed around a 6 inch area. This will soon be followed by a bigger shock. The speed and force of impact of nose on the skin will cause the remaining chassis of the device to separate from the nose and dangle downward from a live copper wire. Barbs – If the assailant is not able to get a hold of the wire to complete the circuit, six longer barbs on the projectile can also pierce the skin. The plastic coating of the barbs will be removed as soon as they come in contact with the body and the half-inch electrodesâ€”called â€œchollas,â€ pop out like spikes and swing into the body. Hand Trap – The first thought that goes through the assailant’s mind is to grab the dangling wire and rip out the barbs. But, since the wire is pulsing with current, the moment he touches it, electricity will begin to flow from the first set of electrodes in the nose of the projectile to the assailantâ€™s hand. Thus he will be forced to contract from the shock and squeeze the wire tightly. Thus, he will be electrocuted with 15 seconds and will be paralysed. Fins – Just like the fins of a fish, the slug also has three fins attached to its rear end. They are used to help the projectile stay on its track as it sails up to 100 feet toward its target. They will be pressed non, when kept inside the slug. As soon as the slug is fired, they will be opened. Transformer – It is used to produce a small power so as to convert the energy from the battery to discharge 1.3 mA of current for 15 seconds. Morover, it plays an important role in the propogation and interaction of the current to produce the correct waveform. Microprocessor – Once the circuit is complete, an onboard computer commands the voltage capacitor to fire, modulating the intensity, duration and shape of the current. Battery – Two Li batteries are used to provide power for the microprocessor and other circuits. 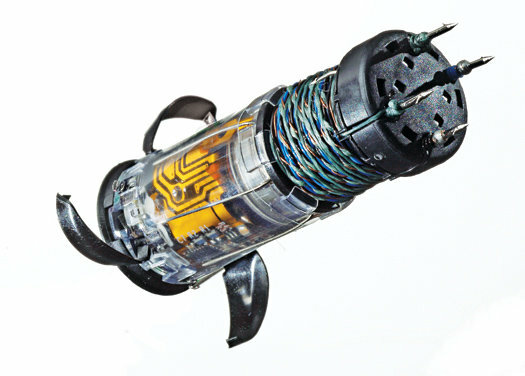 Shell – The circuitry is potted inside shock-absorbing plastic to ensure that it survives the force of the shotgun blast and collision with the target.